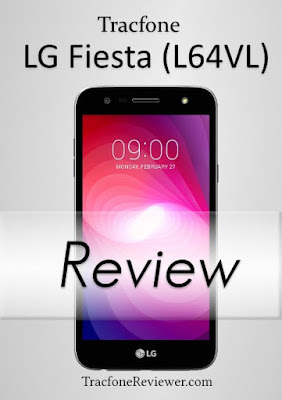 Full details and specs on the LG Fiesta collected and shared by TracfoneReviewer. The LG Fiesta was just released by Tracfone with a large 5.5" touchscreen, Android 7.0 and 16 GB memory. It is a big phone with big specs, but comes at a reasonable price. Tracfone is continuing to add smartphones to their lineup that feature 16 GB internal memory, which is a must for many users. We have been expecting the Samsung Galaxy Sky Pro, which will have 16 GB memory and a 5.5" screen, but there is still no word on when that will be released. Only the CDMA version (the L64VL) of the Fiesta is available right now, but we expect a GSM variant (the L63BL) to be released sometime soon. NOTE: The Fiesta 2 is now available, which features the same specs as the Fiesta, except 2 GB RAM instead of 1.5 GB. There are a lot of promising specs listed for the LG Fiesta that we are very excited about. A 13 MP camera in a phone at this price range is very uncommon. And the fact that this phone runs the newest Anroid OS (at this time) is also quite good. It's not all good, as you may have noticed. 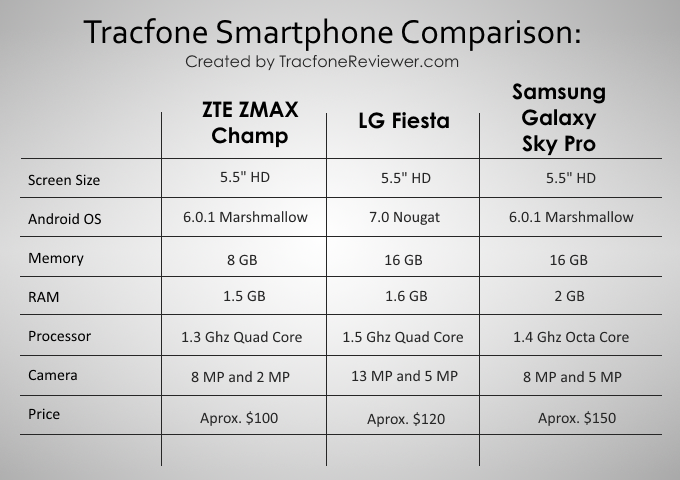 It appears that Tracfone is not offering the LG Fiesta with Triple Minutes for Life. If its true, it would be the first, and only, smartphone from Tracfone that doesn't have Triple Minutes for Life. We will go more in-depth on this further on. One feature we haven't seen on any phones in this price range is the larger megapixel camera. The fiesta has a 13 MP rear camera which far exceeds most other Tracfone devices, including the 5 MP camera on the Galaxy Sky. Not only does the Fiesta have a large camera and large screen, it also has a large battery which is desirable for consumers. While the specs on the Fiesta look quite good, there are better phones offered by Tracfone, including the Samsung Galaxy S5, S6 and S7. Tracfone also offers several iPhone's, including the iPhone 6, 6 Plus and SE. But these phones all come at a higher (in some cases much higher) price. 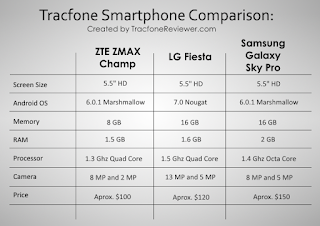 Have a look at our List of the Best Tracfone Smartphones for more information. And now let's get to our review of the LG Fiesta with more detailed information about the main features and specs on this device. The most obvious feature on the Fiesta is the 5.5" touchscreen. This is a popular screen size and a number of smartphones are available at or below $200 with the same size screen. The Moto G4 is one example. However, the Fiesta only has a screen resolution of 1280x720, while the Moto G4 has full HD 1920x1080. It is a noticeable difference, but LG had to find a corner to cut somewhere, and this appears to be it. For typical users, it won't make much of a difference, but videos and games won't look as good compared to devices with full HD screens. Overall the internal specs on the Fiesta are good, with 16 GB memory, 1.5 GB RAM and a 1.4 Ghz quad core processor, the fiesta shouldn't have a problem keeping up with most games and apps, but if you plan to load a lot of media onto the device, you should get a MicroSD card for it because the 10 GB of usable space fills up quickly (especially shooting HD video with the camera). Not that the Fiesta does not allow adoptable storage, and not all apps can be moved to a MicroSD card. The LG Fiesta 2 comes with the same specs, but 2 GB RAM instead of 1.5 GB, which is a nice upgrade, but not enough of a difference for those who already have the Fiesta to go and purchase the Fiesta 2. The Fiesta's camera is 13 MP for the rear camera and 5 MP on the front. There is an LED flash, auto-focus, face detection and HDR. Videos are recorded at 1080p 30fps full HD. Quality is great in good lighting (as are most cameras), but noise starts to really affect the image quality in poor lighting conditions. Overall it is nice to have the extra resolution in the images for better detail. A big phone usually comes with a big battery, but the Fiesta goes way beyond that with the 4500 mAh non-removable battery. By comparison, the Moto G4 has the same size screen, but only a 3000 mAh battery. The iPhone 6S Plus also has a 5.5" screen, but uses just a 2750 mAh battery. The Fiesta is advertised to last, 'all weekend', and we will have to see with further testing if this holds true. In general it does appear to last throughout the day without a problem. One surprise with the Fiesta is that despite the much larger battery, the phone is only slightly heavier than the Moto G4, and actually lighter than the iPhone 6S Plus. Android 7.0 Nougat comes on the LG Fiesta, which is the latest operating system available at this time. It comes with a number of performance, appearance, and security improvements including optimization for extending battery life. With Android OS, access to over a million apps on Google Play is possible and there are apps for nearly anything you can think of, with most of them free. See our list of the Best Android Apps for some ideas. This came as a surprise to us, and everyone else. It appears that Tracfone is not offering Triple Minutes for Life on the LG Fiesta, and any phones with Android 7.0 or newer. At first take this seems like a big negative, but when considering things further, it might not be such a big deal. Triple Minutes only works on regular airtime cards (60, 120, 200, 450, etc.) and these cards generally aren't as good a deal as the smartphone only cards which Tracfone now offers (take a look at our Comparison of Tracfone Airtime Cards for details). So for most users, buying the smartphone only cards is a better deal, and the lack of Triple Minutes on the LG Fiesta won't affect them. But if you do prefer to use regular airtime cards, you should probably avoid the LG Fiesta. Up until this point, all smartphones, including those on Tracfone BYOP, came with Triple Minutes for Life. If you already have a phone with Triple Minutes for Life, nothing will change for you. We are going to continue investigating any changes to Triple Minutes for Life on Tracfone smartphones and will be sharing what we learn in the near future. Some of LG's budget smartphones have been known to have quality issues, such as the LG Treasure and Rebel. Time will tell if that is the case with the Fiesta, but at this time it is a very attractive phone for the price. While some consumers may not want such a large phone, for the majority this will be a great option to upgrade to from older Tracfone smartphones. The large screen takes a little getting used to, but pretty soon it is hard to want a phone with anything less. The Fiesta is fairly similar to the Samsung Galaxy Sky Pro and ZTE ZMAX Champ, but comes with the improved camera and newer Android OS. See the chart on the right for a breakdown of the key differences between these phones, which all feature a 5.5" touchscreen. The Fiesta has a larger screen, better camera and more internal memory compared to the LG X Style. However, the X Style does offer a slimmer, more stylish appearance. And as for the Alcatel OneTouch Pixi Glory we recently reviewed, the Fiesta is better in just about every way, and available for a similar price. Amazon: Find the LG Fiesta on Amazon for $99 including 1000 talk minutes, 2000 texts and 2 GB Data. HSN: The LG Fiesta is currently available with 1500 minutes from HSN for $119 (usually $139). This is a great value, as the airtime bundle is worth over $125..
That concludes our review of the LG Fiesta (L64VL/63BL) from Tracfone. Take a look at the user manual for specific details on using the phone and leave a comment below with your thoughts or questions. Keep up with our latest posts, news and other info by following us on Facebook! Here are the latest and greatest collection of discounted Tracfone devices and unlocked smartphones on sale. We know it can be a challenge to find the lowest price when you are shopping for a new phone, so we monitor and share the best deals from around the web here. We've included both Tracfone smartphones and unlocked devices that can be used with Tracfone BYOP. If you are not sure how bringing your own phone to Tracfone might work, visit our BYOP page or see our Guide to Activating a Tracfone Smartphone or BYOP Device. One of the best ways to get a good deal when buying a Tracfone is to get it with an airtime bundle, which several websites offer. With a bundle, you usually get both airtime and a phone at a discounted price. 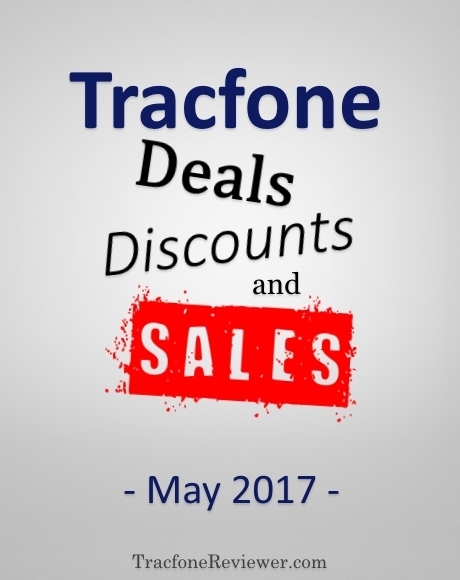 Let's take a look at some great deals on Tracfone Smartphones bundled with airtime. One of the best affordable smartphones from Tracfone at this time, the Galaxy Sky comes with a 5" touchscreen, Android 6.0, 16GB memory and 1.5 GB RAM. It is a popular phone for good reason, and available from QVC bundled with 1350 total minutes plus 1 year of service, which is worth over $100. View our Review of the Galaxy Sky to learn more about the specs. The Premier features a 5.3" touchscreen, 8 GB memory, Android 5.1 and 1 GB RAM. The specs aren't quite as good as the Galaxy Sky, but it does have a larger screen and is capable of most everyday needs. It is available with 1350 minutes and 1 year of service (over $100 value) for just $89. Visit our Review of the LG Premier to see full specs and details. While the Galaxy Grand Prime has been available for about a year, it still delivers some great performance at the price, featuring a 5" screen, 8 GB memory and Android 5.0. This bundle comes with the Grand Prime and 1350 talk/text/data minutes plus 1 year of service for just $89. Now for a few unlocked smartphones that are available at a great price, and can be brought to Tracfone BYOP. While the Moto G5 Plus was recently released, the G4 Plus still packs great value and now can be had at a discount. The G4 Plus features a 5.5" full HD touchscreen, Android 6.0 (with upgrade to 7.0 now available) an octa-core processor and 12MP camera. Visit our review of the Moto G4/ G4 Plus to learn more about what this phone offers. The best budget unlocked smartphone, the Moto G5 Plus has a powerful 2.0 Ghz octa-core processor, 5.2" screen Android 7.0 and 32 GB memory. Visit our Moto G5 Plus page for full specs. It is listed at $229, which is a reasonable price for the performance this phone offers, but Amazon Prime members can get a $45 gift card, reducing the price to $184. If you have any questions, leave a comment below. And please let us know if you find any great deals on unlocked devices or Tracfone smartphones. Join us on Facebook where we share the latest news and information, as well as discounts we find (or are shared with us). 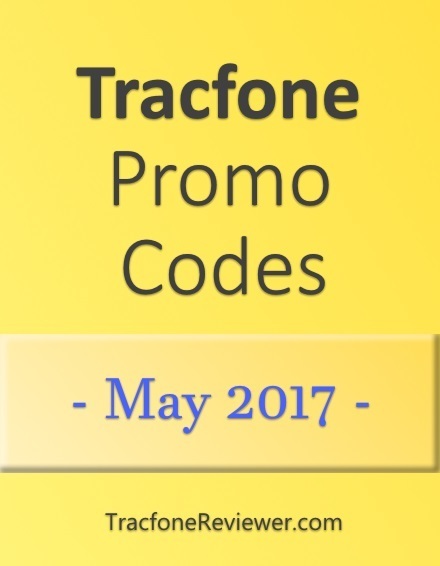 New Promo Codes for May gathered by TracfoneReviewer. We share more than just codes, check out all our news, reviews and information! 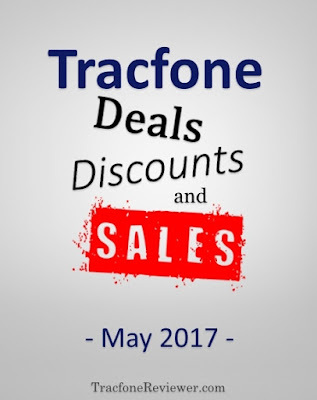 Each month we collect the latest promotional codes from Tracfone and share them here for our readers to use and enjoy. Promo codes can be used with the regular Tracfone airtime cards and each code is meant for a certain card amount, but can also be used on cards of greater value. Tracfone recently changed their website which is making it hard to tell if a code will be accepted or not before adding it. If you're concerned about ensuring you get the bonus minutes, we recommend calling Tracfone and adding the airtime over the phone. We work hard at providing just the newest codes that are valid and working for everyone, but sometimes promo codes don't work because they are limited to certain phones, geographical areas, or are one time use. If you would like to view more promo codes, visit our full Tracfone Promo Code page. These promo codes are npt supposed to work on Android smartphones, but sometimes they do so it is worth trying. If you're considering a new phone, be sure to check out our list of the Top 5 Phones from Tracfone in 2017. You can also visit our Cell Phone Reviews page to see all our recent reviews. Now, let's get to the codes! These are the latest codes and should all be valid through May 2017. Let us know in the comments below which code you used and how it worked. We recently created a guide to Unlocking your Tracfone Cell Phone for those interested. Not all phones are able to be unlocked, but there is an easy way to check. Join us on Facebook where we have a helpful community and also check out our YouTube channel. And you might want to see our list of Tracfone Triple Minute Cell Phones if you don't already have one!